Ventana is a high-end lifestyle magazine distributed all over Ventura County, California… and this month (January 2014) the Bicycle Touring Pro is featured on the magazine’s front cover! Not only am I shown on the cover of the magazine riding my bicycle through a field in the African country of Lesotho, but there is a big article about me and my bicycle touring exploits inside the magazine as well. The article got a few things wrong (I wish they would double-check these things with me before they went to print), but the overall coverage is good. Here are some shots of the front cover… and from inside the magazine as well. The photos featured in the magazine are from my bicycle touring adventures in LESOTHO, SOUTH AFRICA, LUXEMBOURG, UKRAINE and ICELAND. Thank you Ventana for featuring me on the front cover of your magazine! 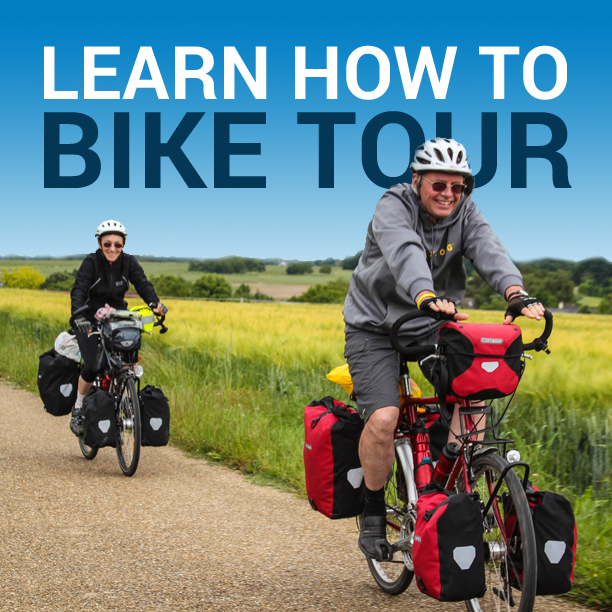 This entry was posted in Darren Alff's Bike Tour Blog, Photos, Website Announcements and tagged bicycle magazine, bicycle touring mag, bicycle touring pro press, bike magazine, lifestyle magazine, press, press coverage, Ventana, Ventura country magazine. Hi Darren, I tried e-mailing you this question before, but maybe you didn’t get my e-mail. I am preparing for my first cross country tour and am concerned about theft, the theft of my bicycle and panniers, actually. Do you lock your bike at night when you camp, or have you had any bad experiences or heard of any bad situations where a tourist was ripped off? Maybe a little paranoid, but I dont want to encounter a situation where I might be stranded! Thanks! Yes, I always lock my bicycle at night if I am in a campground or anywhere with other people around. If I am camped out in the middle of the woods (which I do sometimes) with no one around, then I leave the bike unlocked and have no problem doing that. But if there is even the chance that someone is around, then I lock my bike. Always! That was my original response. However, I should also add that the bike is not kept outside my tent or hotel with all of the bags left on it. Even when I am camping I bring all the panniers that are regularly attached to the bicycle inside the tent with me. And when I am staying in a hotel, the bags always come off the bike and are brought up into my room with me. But yes, the lock is always around the bicycle when it is out of sight. Hi Darren, I appreciate your answer. Thank you so much! I am an avid backpacker, and on one hiking trip with a couple of buddies, my friend had his pack stolen outside a store with all his essential gear. It ruined the trip. I think I will ALWAYS lock my bike, no matter what. Thanks again!